For many years, Broad Street was a vital cog in the capital’s transport infrastructure. Situated in the heart of The City, the station sat right next door to Liverpool Street station–in fact, Broad Street was on the scene first, opening as a terminal for the Great Northern Railway in 1865, 9 years before its larger neighbour moved in. Broad Street was originally envisioned as a goods depot; a hub designed to link rail freight travelling between Birmingham and London’s sprawling docks; both key players in Britain’s then vast empire. However, some bright spark suggested that, being in the heart of the financial district, it would be a good idea to encourage passenger use too. They were right and, during the first half of its life, Broad Street, along with Liverpool Street and Victoria, was one of London’s top three busiest stations, pouring 1,000s of commuters into the City every day from areas such as Camden, Stratford, Watford and Richmond. In 1902 alone, it was recorded that 27 million people passed through Broad Street. However, as the 20th century progressed, passenger numbers began to decline; primarily due to the increased development of the tube and tram networks which were able to ferry commuters around with greater flexibility. Broad Street’s effectiveness as a major rail terminal was also hindered during the two World Wars. 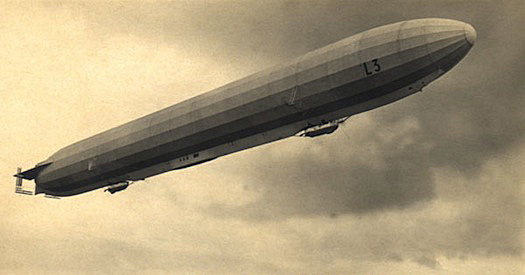 In WWI, the station suffered at the hands of Germany’s fearsome new weapon- the Zeppelin. On the night of the 8th September 1915, an enemy airship, piloted by Heinrich Mathy- notorious as being the most brazen of the Zeppelin pilots and who had carried out the most bombing raids on the UK- unleashed the Great War’s most destructive attack on the capital. Approaching the UK via Cambridge, arcing around Hertfordshire and North London, Mathy navigated his hulking craft high over Golders Green, following the Finchley Road before taking a detour towards the centre of the capital where the assault commenced. Russell Square, Theobalds Road (where the Dolphin Tavern was hit- a clock which was damaged in the attack can still be seen behind the bar), Hatton Garden, Farringdon Road (where a plaque commemorates the event) and Bartholomew Close in Clerkenwell were all pounded. Heading further east, the Zeppelin then approached the capital’s financial heart where it released further vengeance. One bomb exploded directly outside Broad Street station, striking a bus; killing the conductor and several passengers. More bombs were unleashed over nearby Norton Folgate, causing considerable damage to the tracks leading into the station. The raid that night claimed the lives of 22 Londoners, with 87 more seriously injured. Heinrich Mathy himself was killed a year later when the Zeppelin he was captaining was shot down over Potters Bar by the renowned flying ace, Leefe Robinson. During the Blitz of WWII, Broad Street escaped being hit directly. However, a number of East-End stations serving the terminal were so badly damaged during the nightly raids that they were forced to close for good. These included stations at Haggerston, Shoreditch, Victoria Park and an entire line which branched out to Poplar. Such closures only served to add to Broad Street’s passenger drain. As passenger numbers dwindled, so too did the building itself and, by the late 20th Century, Broad Street station was in a very poor state of repair. “Standing on the empty concourse at Broad Street today, one has a feeling of its former greatness. In 1984 Broad Street station was granted one final gasp of recognition; lending its name to Paul McCartney’s album and film of the same title; Give My Regards to Broad Street. In the film, the former Beatle has 24 hours to track down the master tape for his latest album which has gone missing. The recording is discovered towards midnight, in a forgotten cupboard at Broad Street station itself, rather appropriate considering how decayed and overlooked the once grand station now was. Sadly, the movie was a commercial and critical failure, its reviews almost as depressing as the state of the station itself. A scene featuring Paul McCartney pacing around Broad Street station appears towards the end of the film, illustrating just how desolate and dilapidated it had become by this point. By 1985, only 6,000 people per week were using the station’s limited service- miniscule by London standards and a colossal downfall when compared to the station’s late 19th century heyday. Towards the end of its life, only two of Broad Street’s nine platforms were in use; the other seven being left to crumble and succumb to weeds. In June 1986, the station was finally wound down and closed for good. Today, Broad Street has all but vanished. The station’s closure coincided with the massive 1980s financial boom, when office space was in particularly high demand- planning permission for such space tripled between 1985-1986. Consequently, before the dust from Broad Street’s demolition had even settled, developers stormed in, hard-hats on, tape measures in hand, quickly forging the 32 acre ‘Broadgate’ complex; a large area consisting of squares, offices, shops and restaurants. The project commenced with a ceremony in which then Prime Minister, Margaret Thatcher, fired up the site’s first crane. Part of today’s Broadgate complex… this office block stands on the former site of Broad Street’s main building. Part of Liverpool Street station can be seen to the right of the photograph. At its full capacity, Broadgate is capable of serving some 30,000 workers. The Broadgate site also contains a wide collection of specially commissioned public sculptures, one of which is ‘Fulcrum’, towering over the junction of Liverpool Street and Eldon Street, roughly marking the point where Broad Street’s forecourt once stood. Sculpted in 1987 by Californian artist, Richard Serra, Fulcrum is crafted from several huge planks of steel (rumour has it that the slabs are old girders from the former station, although as yet I’ve been unable to confirm this). The trick of this artwork is that the plates are not welded together or joined in any firm way; relying upon the law of physics alone to keep them in place… if you dare to walk beneath them, you can find a small, but well sheltered oasis from the surrounding crowds! Old sections of the mouldy, brick viaduct, which once carried trains over the rooftops and into Broad Street, can still be seen hiding north of Liverpool Street, around the Shoreditch area. One section of the viaduct has been cleverly recycled and is now home to the quirky ‘Village Underground’; a unique collection of artists’ studios. What makes Village Underground so wonderfully distinctive is that the creative spaces are housed within old tube carriages! These particular models of tube car (of which only 30 were built) ran on the Jubilee line between 1983 and 1998. Growing up during this period, I personally remember them well, with their slattted wooden floors and orange, chequered seats. As I drive past in my cab below, I often find myself wondering how many times I travelled on the Village Underground carriages when they carrying out their original purpose down in the Jubilee tunnels! Elsewhere in London, another ex-1983 stock tube carriage has been put to a similar eccentric use- you’ll find it in the grounds of Great Ormond Street Children’s Hospital, where it acts a studio for ‘Radio Lollipop’! A little further up, in the vicinity of New Inn Yard (now fittingly renamed New Bridge Yard), the old arches are once again back in use; linking up with a spanking new viaduct which, since 2010, has carried the new London Overground line; an extensive route which has merged existing lines and reactivated dormant ones- including a section of tracks which once ran into Broad Street. Unveiled at Broad Street in February 1921 and dedicated to the 69 men of the Great Northern Railway who lost their lives during WWI, this memorial- which resembles Whitehall’s solemn Cenotaph in miniature form- was carefully removed during the levelling of Broad Street in 1986. After being kept in storage for three years, it was then moved south to Richmond, one of the more far-flung stations which had been connected to Broad Street, where it remained until 2011. 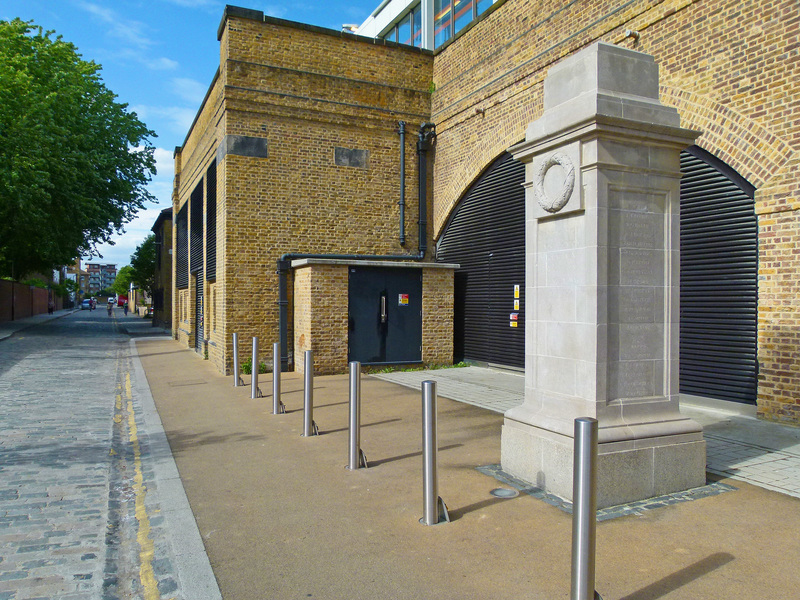 With the opening of the London Overground and the reinstatement of routes which had once served Broad Street, it was decided to move the war memorial closer to its original home. On 7th June 2011, the little cenotaph arrived in Hoxton and was rededicated by the Reverend James Westcott (of St Chad’s Church, Haggerston) in a respectful, low-key ceremony. 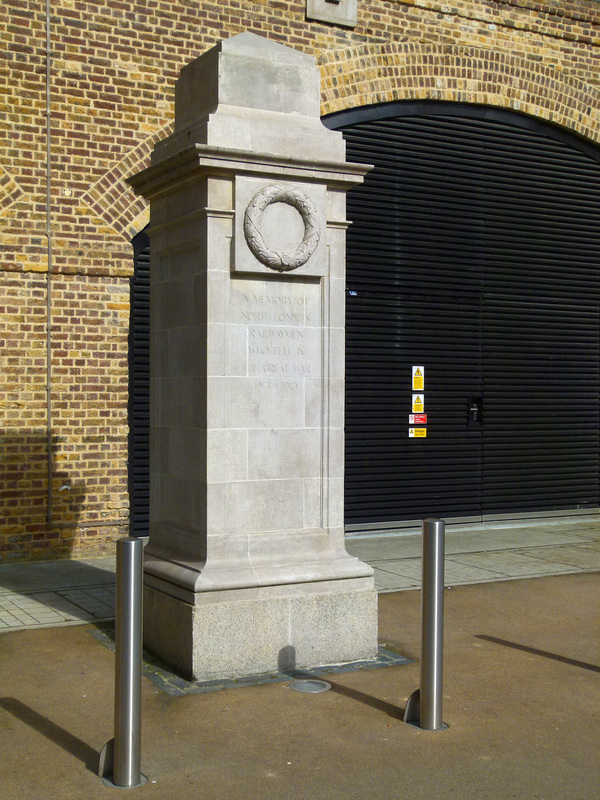 The newly re-located memorial, along with the new London Overground route (the popularity of which was correctly predicted by Sir John Betjeman) have ensured that the spirit of Broad Street can quietly live on within the capital it once so effectively served. Another fine post Robert, a great story of Broad Street’s rise like a Phoenix from the ashes of dereliction into a fantastic business centre. With a mention of one of my childhood’s favourite memories, the tales about the epic dog fight victories of Leefe Robinson. So sad that only weeks after coming home a hero he fell victim to a deadly stain of influenza, that swept Europe after the great war. Really appreciate those kind words, Jason thank you so much. I imagine you may already know, but the great man, Leefe Robinson is buried at Harrow Weald (All Saint’s Churchyard). So sad that he survived the war, only to die months later from influenza. What an absolutely brilliant post. I remember the mcartney video, i believe it begings on a rooftop somewhere with him whistling. I’ll have to look it up. Fairchild place sadly was where the footballer Justin Fashanu hanged himself. A well researched piece and a good addition to your collection of historical posts on our ever fascinating London. I am familiar with Liverpool Street Station and the Broadgate complex because we pass there often but until now I had not realized that there had been another station there before. I will see the place with new eyes henceforth! Hi. The best detail of the Old Broad Street Station I ahve found. This station is a very large memory for me as an Apprentice Electrician in the Outdoor machinery Department of Britiah Rail Braod Street was the first depot I went to after leaving the Training School in April 1960. We wotked on the Station and in the Goods Yard which was very busy in those days with Meat for Smithfield, Fruit and Veg for Covent Garden and Fish for Billingsgate plus general freight. The goods yard was on two levels, the upper level was where the trains came in the the wagons were shunted by capstan and rope using small turntables onto Wagon Hoists and lowere to street level where thery were shunted down platforms for unloading. The real busy time was when they started to move the Wagons from the lower level to the upper level at 12:00 midday to make the Midday Scot which usually amounted to 70 to 80 wagons and it usually left on time at 1:00 pm, it was wise to keep out of the way. All the capstans, Wagon Hoists, Lifts and Cranes were operated hydraulically by water from the London Hydraulic Company who also supplied water to operate Tower Bridge and to the Armstrong Lift at Waterloo Station to lift the Waterloo and City line trains from the tunnels. Hi Ray, thank you so much for sharing your memories- fantastic stuff, really enjoyed the insight. Great post and interesting read, I’m not old enough to remember Broad Street but this area fascinates me as I have lived and worked here for a few years now and my dad grew up near spitalfields. I use the London overground everyday and the use of the existing viaducts and infrastructure (Haggerston, Hoxton as examples) of the north London line running into what was Broad Street is really impressive. 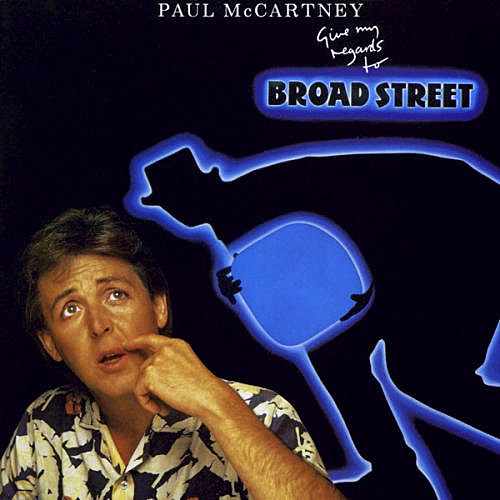 I’m sure Broad St was used in a more distinguished film than Macca’s 1984 effort( still a good song, though). I did watch a horror portmanteau from 1972 called From Beyond The Grave and one story features Donald Pleasance playing a match seller who keeps accosting a commuter played by Ian Bannen. While I’m not 100 per cent certain, the station and the streets around it look very much like Broad St. Anyone else like to help me out on this? It’s a good point, I’d be very interested to know what else was filmed there. I’m sure there must have been the odd TV scene too. My father and his brother, Charles and Morris Newstead ran a cab garage from Fairchild Place in the early 60s.Great Eastern Garage. He took me there once and I think I recognise the arches at the end of the street.The photo with the blue doors on the arch entrance. Dont suppose any one else has info. on this ? Mums still alive but sadly dad has died now. Thanks Peter. If you’re keen on finding out more info you could try contacting one of the trade’s magazines (such as the LTDA taxi magazine), they’ll be able to put a request out there for you. Great post and fascinating read, as others have said. As a train spotter from Wembley in the late 1950’s and early 1960’s, Broad Street held a fascination for me as it was so quiet and already sliding into dereliction. My family travelled to Liverpool Street via Broad Street as the start of our frequent visits to Ipswich, my dad’s home town. And we also used it for trainspotting trips to Liverpool Street via the Watford-Broad Street line which at the time still offered “fast” trains (The City Expresses-one ran non stop from Stonebridge Park to Dalston Junction, even missing out Queen’s Park). For years I had a strong memory of seeing a direct Broad Street-Cambridge train advertised on the departure indicator at Broad Street on a Saturday lunchtime but thought it must have been my imagination until I checked a 1962 timetable which confirmed that one such service did run , and took nearly two hours to complete the journey. Quite a leisurely experience! Delighted that the route southwards from Dalston to (nearly) Broad Street has been revived and is back in use again. I still think there could have been a future for Broad St as a terminus for London Overground services, or as an overspill for Liverpool St. However, British Rail in the seventies and eighties were determined to slowly kill off Broad St and watching the Paul Mc Cartney video again, the station was a deserted wreck with only a lone passenger leaving the station, someone in the ticket office and Paul Mc Cartney singing on a platform. Thanks, Glenn nice comment and interesting thoughts. Thanks Peter, that’s a fascinating (and very sad) story. Interesting memories. More recently in the North East, men who crossed the picket lines in the miners strike are often shunned by their former workmates even though the strike ended in 1985 and the industry collapsed by the mid nineties. It’s sad, but crossing a picket line or ignoring a strike call was a dangerous business on the railways and in the coal industry as you could be sent to Coventry indefinitely, occasionally subject to violence, or forced to move.